Yoga and meditation are not just extracurricular activities. Many employers now offer on-site wellness programs to boost morale and health around the office. 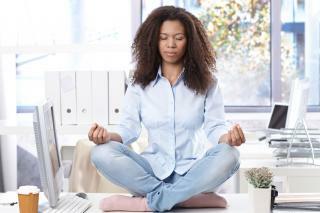 More companies are bringing yoga or meditation practices to their offices to help reduce stress and boost productivity. It's not surprising, as yoga in the workplace proves to be effective at lowering stress and improving overall well-being for employees. About one-fourth of American employers now offer some kind of stress reduction options, according to New York Times reporter David Gelles, in his book Mindful Work. "One of the most surprising and promising trends in business today is the rise of mindfulness in the workplace," Gelles writes. "At first, the notion of yoga and meditation in the office seemed like the province of Silicon Valley startups where employees bring their dogs to work and play football in the lobby. But in recent years, mindfulness has gone mainstream." Yoga and other complementary modalities can benefit the bottom line for employers too, says Mark Bertolini, chief executive of the health insurer Aetna. At Aetna, they calculated that workers with the highest levels of stress cost the company $2,000 more each year than less stressed employees. Once the company starting offering wellness programs, including yoga and mindfulness-based programs, employees experienced less stress and their productivity increased, too. "Helping employees build resilience and reduce stress isn't just the right thing to do--it can also help the bottom line," Bertolini wrote. "Stress is a universal issue that has a direct impact on people's health and increases health-care costs. Highly stressed individuals are at greater risk for many different health conditions, such as coronary heart disease, some cancers, diabetes, depression and anxiety, and obesity." Companies also offer yoga and meditation as perks to attract and retain employees, according to Lauren Coles, founder of Daisy Office Yoga. "Perks like yoga, meditation, and naps can attract harder-to-find employees, like software developers and other competitive talent with multiple offers," she says. "Beyond that, these perks have real value, and studies show that yoga, meditation, and sleep measurably increase happiness." If your company doesn't offer a formal wellness program, try to find ways to stretch or get a few minutes of quiet time during your day. Try some of these quick and easy yoga stretches from yoga teacher Lilias Folan at your desk, at the airport, or even right after a meeting in a conference room. Or, read more about how to bring mindfulness to work by Rasmus Hougaard, founder of the Potential Project, a leading provider of corporate mindfulness programs.